Collars can be used to show a variety of different things. They can be an intimate gesture, and there are hundreds of different designs and techniques that one can choose from when ordering a collar. People can order collars to fit their neck, ankle, or wrist. It is important to know how long a collar needs to be to fit just right. Collars are meant to fit snug against one’s skin. Therefore when judging the length of the collar being ordered, the length of the collar will be the exact measurement of the area it is being made for. For instance, if the collar is for a wrist and the wrist is 4 inches around, then when ordering the collar, one will order it to be 4 inches in length. Click here to see a visual of how to best judge the length of your collar. If one has sensitive skin, there are options that they can take when ordering their collar to make it so it does not irritate there skin. For instance, nickel is the cause of a lot of people’s skin irritations. However, there are nickel-free options that people can choose to avoid this. 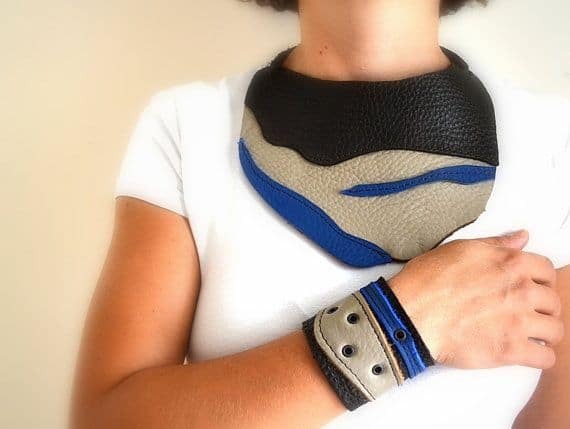 Most collars are made out of animal hide leather, but for people who want an animal friendly option, they can choose to have their collar made out of a rubber material.